Good morning! How are you ? How was your week? We've had so much rain here all week. Yesterday I met Holly for lunch in Walnut Creek and on the ride home I saw and abundance of gorgeous rainbows. Really beautiful intense colors. Rainbows always make me feel so happy and hopeful. 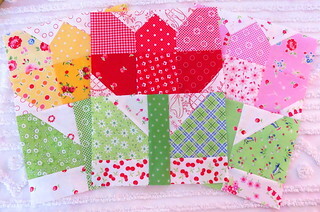 I have done some sewing, adding a red tulip to my collection. I like just working a bit at a time. Maybe a mixed up color tulip will be next. Or aqua, or who knows. Are there aqua or blue tulips? Should that matter? Working on something pink. Nothing too fancy. 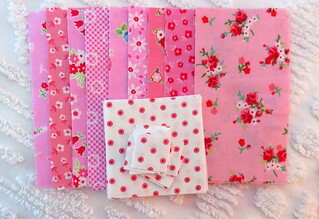 But I enjoy laying out all the pretty pinks together. I'm enjoying small projects. What are you working on? I love your tulips! I was curious about the tulip colors since you asked, so I looked it up. Google said that they come in every color of the rainbow, even purple and dark maroon. Love your tulip blocks. So bright and cheerful - ready for spring! I was very energetic at the end of 2016 and emptied some scrap baskets making Log Cabin blocks for Haystack quilts. It sure felt good, but now my Walking Foot broke, so it might be awhile before they get quilted :)! So pretty! Love tulips both real and in patchwork...and the colours are just perfect!